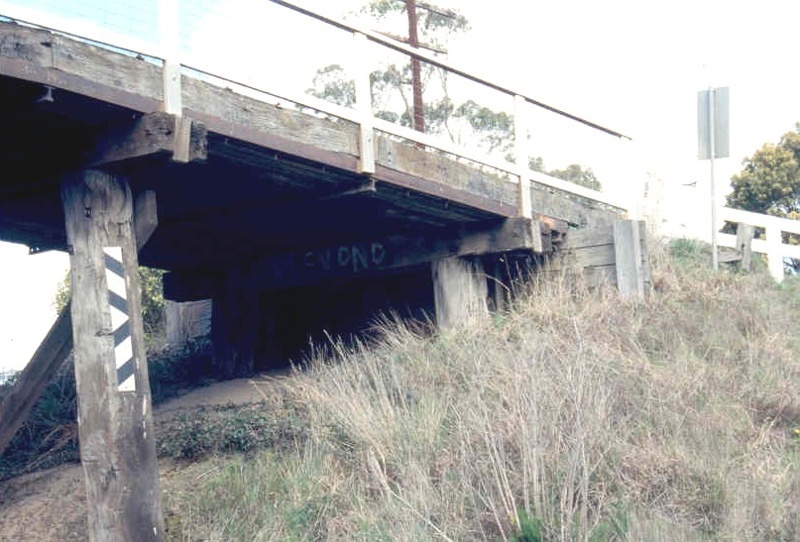 The Portland Flat Road bridge is a hump backed road over rail bridge on the Portland Flat Road spans the Western Railway line running between Melbourne and Ballarat. 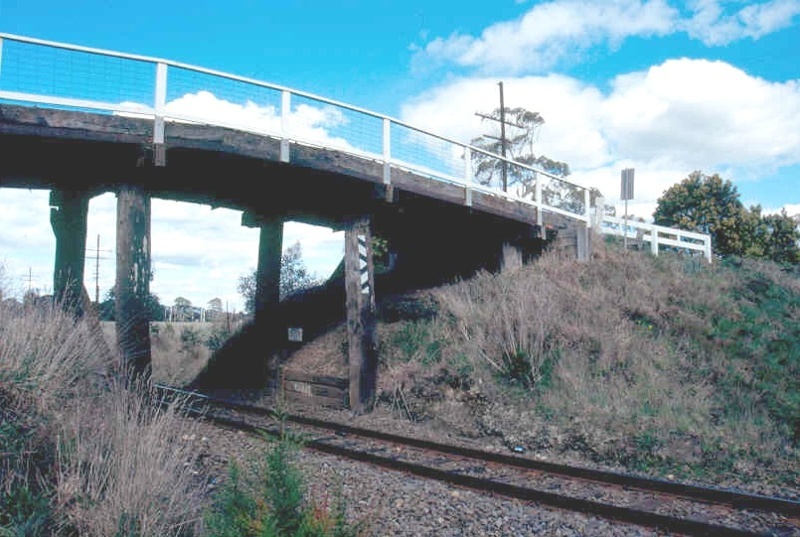 The bridge is located between Gordon and Ballan. The Western line between Melbourne and Ballarat was opened in stages and formed the last link in the inter colonial railway between Adelaide and Melbourne. 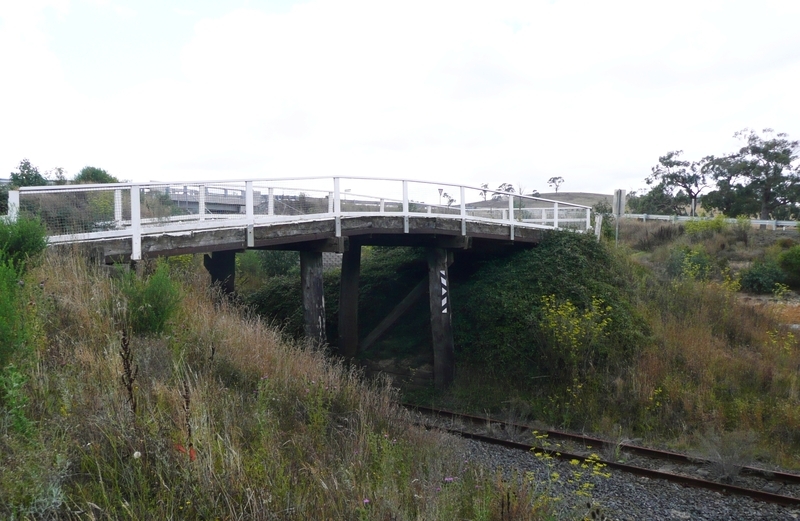 The link between Gordon and Ballan, which this bridge crosses, was opened in 22nd December 1886, with the final link in the line, between Ballan and Bacchus Marsh opened on the 4th of December 1889. The bridge was not part of the original works, rather a level crossing with a gatehouse was provided. However as the crossing is on a bend there were concerns about the danger of fast express trains meeting slow horse drawn carriages and carts. Drawings were prepared in October 1899 and the Ballan Times reported on the June the 6th 1900 that the bridge was built. The bridge deck is constructed of a concrete slab poured over a base of thirty two longitudinal recycled light railway lines that act as both formwork and reinforcement. The road surface is a rock base with an asphalt top. The supporting structure consists of four pairs of hardwood piles, each pile is typically 550mm in diameter. The centre pairs being braced with 245x130 hwd scantlings. The inside faces of the centre piles have been squared off to maximize clearance. 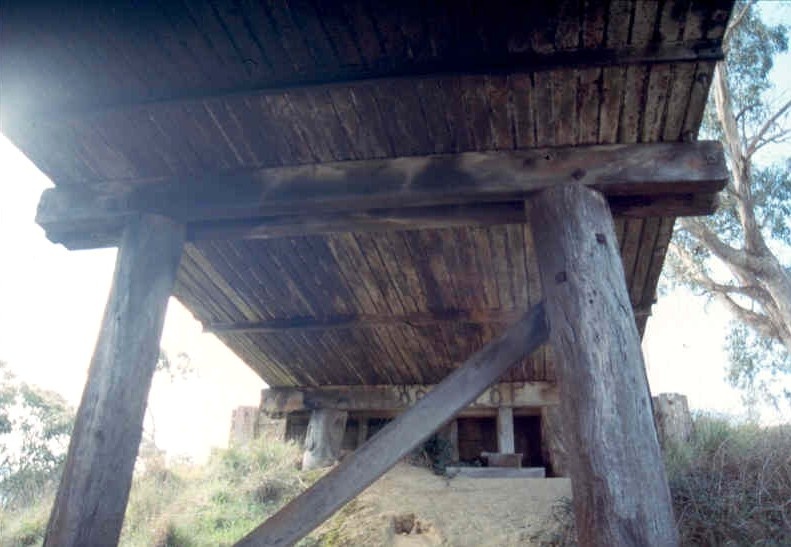 Across the top of each pair of piles are two 330x160 cantilevered bearers. The Portland Flat Road road over rail bridge is of architectural and scientific (technological) significance to the State of Victoria. The Portland Flat Road road over rail bridge is architecturally and scientific(technological) significant as an outstanding example of rail in slab bridge construction and clearly displays a number of features that are representative of the type, such as the placement of the rails in the deck and the length of the spans. The bridge is also technologically significant in demonstrating technical innovation. This includes the rail in slab deck. Rail in slab construction utilises redundant light railway lines to reinforce a concrete slab. As such the Portland Flat Road bridge is significant as an example of early reinforced concrete bridge construction, being built within a decade of its earliest known use in Australian. The bridge is also a fine representative example of a form of construction utilising recycled redundant materials. Technical innovation is also evident in the rails that form the deck. These cantilever past the supporting main span piles to support the centre span. This is of importance because of the early date of construction. 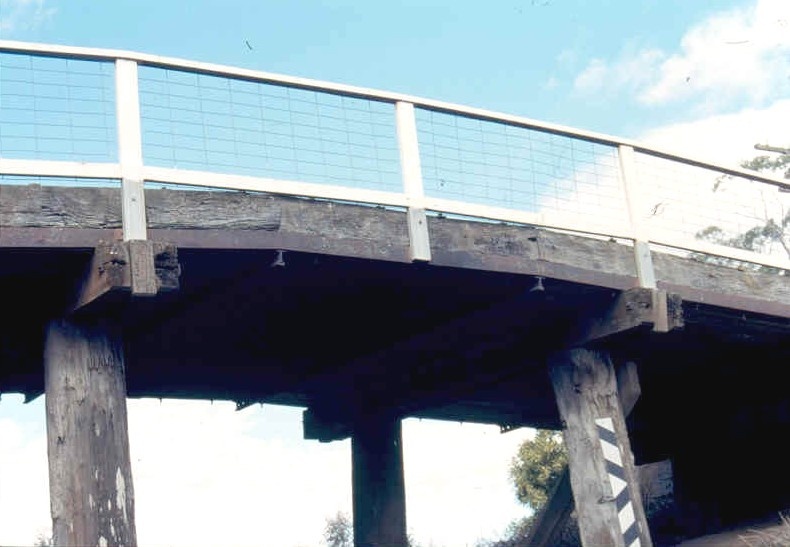 This being within twelve months of the construction of the bridge at Great Western which is first known use of this technique on a road over rail bridge that was built by the former Victorian Railways. The Portland Flat Road Bridge is also of architectural significance as a rare surviving example of a rare form of bridge i.e. hump backed, with a timber sub structure and with rail in slab deck built, by the former Victorian Railways. 1. 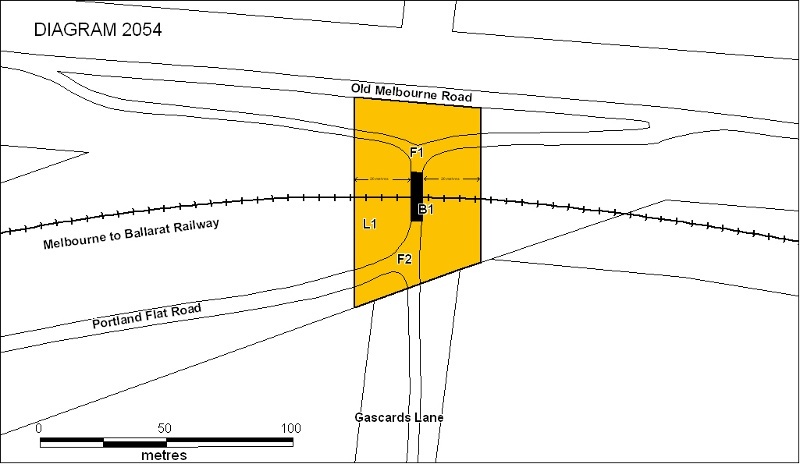 All of the bridge structure known as the Portland Flat Road road over rail bridge over the Melbourne to Ballarat railway line, Gordon, including the deck, superstructure, retaining walls and abutments (B1), the roads and embankments marked (F1) and (F2) on Diagram 2054 held by the Executive Director. 2. All of the land surrounding the bridge marked L1 on Diagram 2054 held by the Executive Director. 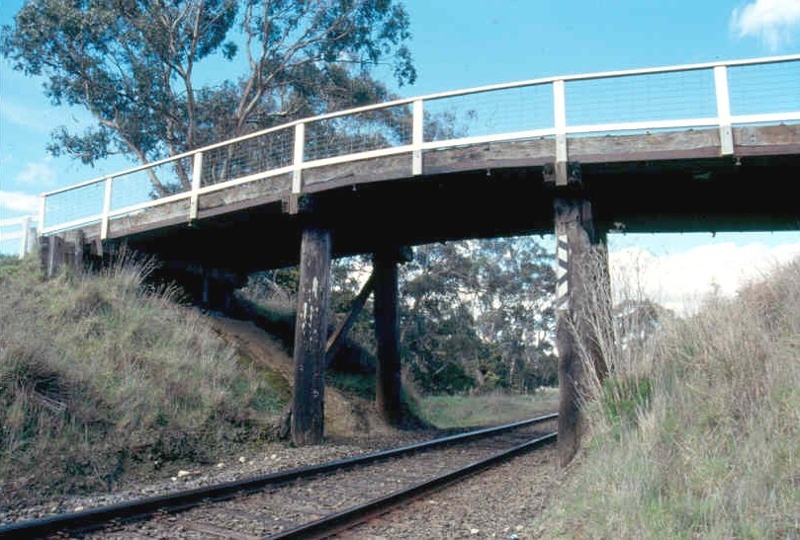 · The Western line between Melbourne and Ballarat was opened in stages and formed the last link in the inter colonial railway between Adelaide and Melbourne. The link between Gordon and Ballan, which this bridge sits on, was opened in 22nd December 1886, with final link in the line, between Ballan and Bacchus Marsh on the 4th of December 1889. 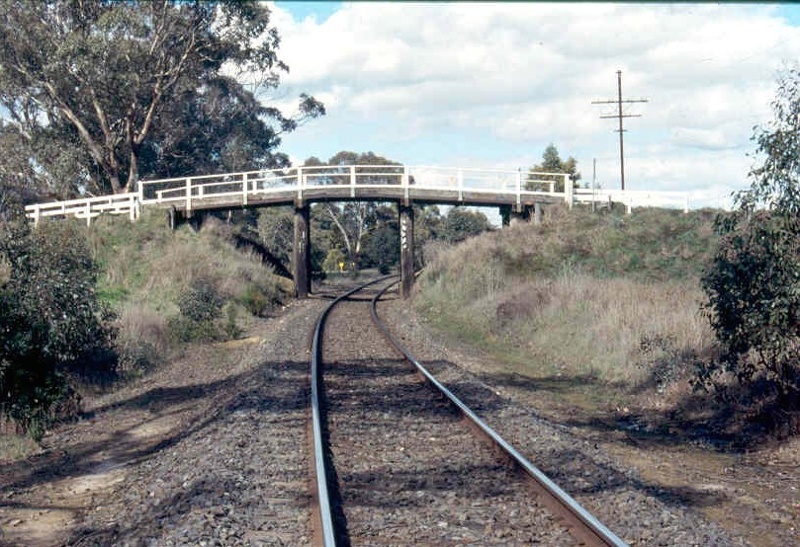 · There is a four way intersection at the point the bridge crosses the railway line. The bridge was not part of the original works, rather a level crossing with a gatehouse was provided. However as the crossing is on a bend there were concerns about the danger of fast express trains meeting slow horse drawn carriages and carts. Drawings were prepared in October 1899 and the Ballan Times reported on June the 6th 1900 that the bridge was built. · The rails were lowered after the plug on a roof mounted tank on passenger car hit the low end of a handrail post on the 14th March 1918. 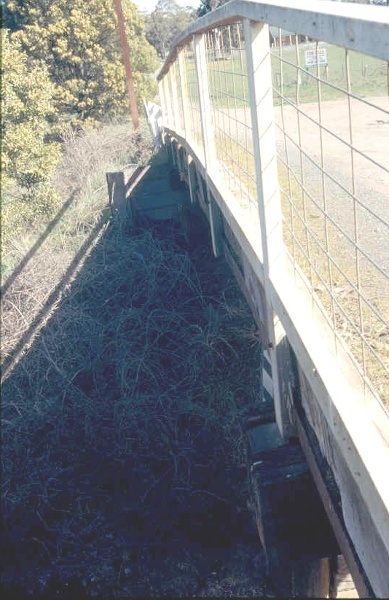 · Reports were made in 1959, 1970 and 1974 drawing attention to the need for maintenance of the bridge and an engineers report in 1979 recommended the demolition of the bridge. According to Andrew Ward photos of the bridge in 1979 show the original railings but 1990 photos show them changed. It would therefore seem as if they were changed sometime in the in the intervening period. · A pile was struck by a train in 1990 and it was agreed that the rails should be skewed. There were work orders for the renewal of piles in 1994 and 1997. General Conditions: 1. All exempted alterations are to be planned and carried out in a manner which prevents damage to the fabric of the registered place or object. General Conditions: 2. Should it become apparent during further inspection or the carrying out of works that original or previously hidden or inaccessible details of the place or object are revealed which relate to the significance of the place or object, then the exemption covering such works shall cease and the Executive Director shall be notified as soon as possible. Note: All archaeological places have the potential to contain significant sub-surface artefacts and other remains. 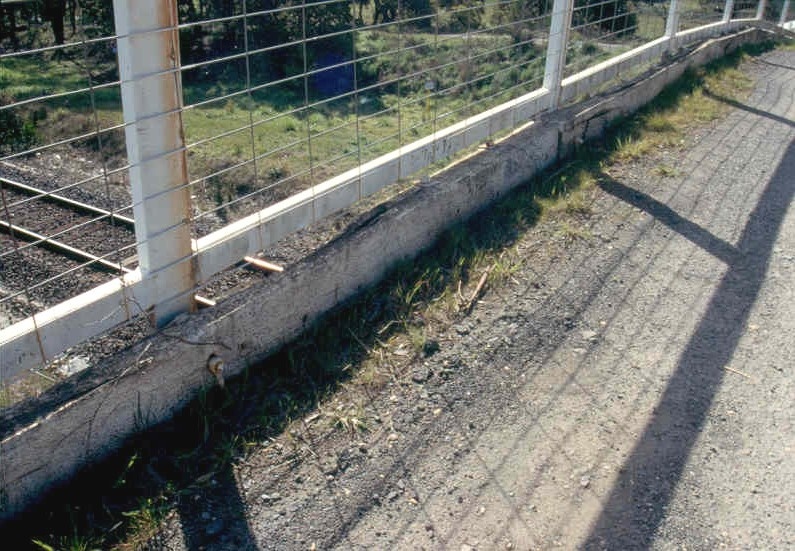 In most cases it will be necessary to obtain approval from Heritage Victoria before the undertaking any works that have a significant sub-surface component. General Conditions: 3. If there is a conservation policy and plan approved by the Executive Director, all works shall be in accordance with it. Note: The existence of a Conservation Management Plan or a Heritage Action Plan endorsed by Heritage Victoria provides guidance for the management of the heritage values associated with the site. It may not be necessary to obtain a heritage permit for certain works specified in the management plan. General Conditions: 4. Nothing in this declaration prevents the Executive Director from amending or rescinding all or any of the permit exemptions. General Conditions: 5. Nothing in this declaration exempts owners or their agents from the responsibility to seek relevant planning or building permits from the responsible authorities where applicable. Regular Site Maintenance : The following site maintenance works are permit exempt under section 66 of the Heritage Act 1995, a) regular site maintenance provided the works do not involve the removal or destruction of any significant above-ground features or sub-surface archaeological artefacts or deposits; b) the maintenance of an item to retain its conditions or operation without the removal of or damage to the existing fabric or the introduction of new materials; c) cleaning including the removal of surface deposits, organic growths, or graffiti by the use of low pressure water and natural detergents and mild brushing and scrubbing; d) repairs, conservation and maintenance to plaques, memorials, roads and paths, fences and gates and drainage and irrigation. e) the replacement of existing services such as cabling, plumbing, wiring and fire services that uses existing routes, conduits or voids, and does not involve damage to or the removal of significant fabric. Note: Surface patina which has developed on the fabric may be an important part of the item’s significance and if so needs to be preserved during maintenance and cleaning. Note: Any new materials used for repair must not exacerbate the decay of existing fabric due to chemical incompatibility, obscure existing fabric or limit access to existing fabric for future maintenance. Repair must maximise protection and retention of fabric and include the conservation of existing details or elements. Fire Suppression Duties : The following fire suppression duties are permit exempt under section 66 of the Heritage Act 1995, a) Fire suppression and fire fighting duties provided the works do not involve the removal or destruction of any significant above-ground features or sub-surface archaeological artefacts or deposits; b) Fire suppression activities such as fuel reduction burns, and fire control line construction, provided all significant historical and archaeological features are appropriately recognised and protected; Note: Fire management authorities should be aware of the location, extent and significance of historical and archaeological places when developing fire suppression and fire fighting strategies. The importance of places listed in the Heritage Register must be considered when strategies for fire suppression and management are being developed. Weed and Vermin Control : The following weed and vermin control activities are permit exempt under section 66 of the Heritage Act 1995, a) Weed and vermin control activities provided the works do not involve the removal or destruction of any significant above-ground features or sub-surface archaeological artefacts or deposits; Note: Particular care must be taken with weed and vermin control works where such activities may have a detrimental affect on the significant fabric of a place. Such works may include the removal of ivy, moss or lichen from an historic structure or feature, or the removal of burrows from a site that has archaeological values. Landscape Maintenance : The following landscape maintenance works are permit exempt under section 66 of the Heritage Act 1995, a) landscape maintenance works provided the activities do not involve the removal or destruction of any significant above-ground features or sub-surface archaeological artefacts or deposits; b) watering, mowing, top-dressing and fertilising necessary for the continued health of plants, without damage or major alterations to layout, contours, plant species or other significant landscape features; c) pruning to control size, improve shape, flowering or fruiting and the removal of diseased, dead or dangerous material, not exceeding 20% of the crown of the tree within a period of two years; d) tree surgery by a qualified horticulturalist or tree surgeon necessary for the health of those plants. Public Safety and Security : The following public safety and security activities are permit exempt under section 66 of the Heritage Act 1995, a) public safety and security activities provided the works do not involve the removal or destruction of any significant above-ground structures or sub-surface archaeological artefacts or deposits; b) the erection of temporary security fencing, scaffolding, hoardings or surveillance systems to prevent unauthorised access or secure public safety which will not adversely affect significant fabric of the place including archaeological features; c) development including emergency stabilisation necessary to secure safety where a site feature has been irreparably damaged or destabilised and represents a safety risk to its users or the public. Note: Urgent or emergency site works are to be undertaken by an appropriately qualified specialist such as a structural engineer, or other heritage professional. Signage and Site Interpretation : The following Signage and Site Interpretation activities are permit exempt under section 66 of the Heritage Act 1995, a) signage and site interpretation activities provided the works do not involve the removal or destruction of any significant above-ground structures or sub-surface archaeological artefacts or deposits; b) the erection of non-illuminated signage for the purpose of ensuring public safety or to assist in the interpretation of the heritage significance of the place or object and which will not adversely affect significant fabric including landscape or archaeological features of the place or obstruct significant views of and from heritage values or items; c) signage and site interpretation products must be located and be of a suitable size so as not to obscure or damage significant fabric of the place; d) signage and site interpretation products must be able to be later removed without causing damage to the significant fabric of the place; Note: The development of signage and site interpretation products must be consistent in the use of format, text, logos, themes and other display materials. Note: Where possible, the signage and interpretation material should be consistent with other schemes developed on similar or associated sites. It may be necessary to consult with land managers and other stakeholders concerning existing schemes and strategies for signage and site interpretation. Mineral Exploration : The following Mineral Exploration activities are permit exempt under section 66 of the Heritage Act 1995, a) mineral Exploration activities provided the works do not involve the removal or destruction of any significant above-ground features or sub-surface archaeological artefacts or deposits; b) preliminary non-intrusive exploration, including geological mapping, geophysical surveys, and geochemical sampling and access to shafts and adits; c) advanced forms of exploration (drilling), including the location of drill pads and access tracks where this has been the subject of on-site negotiation and agreement with representatives of Heritage Victoria, DSE and Parks Victoria, and where all significant historic site features have been identified and protected as part of an approved work plan. Minor Works : Note: Any Minor Works that in the opinion of the Executive Director will not adversely affect the heritage significance of the place may be exempt from the permit requirements of the Heritage Act. A person proposing to undertake minor works may submit a proposal to the Executive Director. If the Executive Director is satisfied that the proposed works will not adversely affect the heritage values of the site, the applicant may be exempted from the requirement to obtain a heritage permit. If an applicant is uncertain whether a heritage permit is required, it is recommended that the permits co-ordinator be contacted. The Portland Flat Road road over rail bridge is significant as an outstanding and rare example of innovative bridge construction as well the shape of the bridge, hump backed, being a particularly rare form. Because the railway was originally crossed at this point by a level crossing and the bridge was built later it is crucial to consider the bridge’s setting which includes the embankments and the road connections leading to and from the bridge. As such any works that are proposed in the vicinity ofthe bridge, the embankments and the roads and road junctions leading to and from the bridge will require a permit.